Austin, Beau and Richie....Great "Get it done" team! Just in for accessories for new car and like Emeril Lagasse, "Bam!" Done and done well! Thank you, gentlemen. Both of our cars (2006 Corolla) and (2012 Camry) are always well cared for under the direction of Kyle June. My vehicles have never been serviced at any other Toyota dealership and have never missed a scheduled service. I went in for routine maintenance and, while there, was able to explore options for a new vehicle. Worked with Charlotte Coxsetter and was pleased with the choices available to me for a new car, so I turned in my old one and got the new one. Everyone was professional, courteous and a pleasure to deal with. Was very pleased in in the amount of effort that was put into me getting the perfect vehicle. The employees were very kind and helpful. Daniel was very professional. He handled all our questions and concerns, very detailed, and friendly. 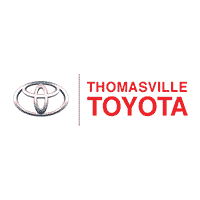 After visiting several Toyota dealerships within 100 mile radius, we will be back to Thomasville for future service. In the past, I have dreaded coming into the Service Department at Thomasville Toyota. I dreaded it so much that it would cause me to put off maintenance on my vehicle until it was overdue. Even with an appointment the wait times were horrendous, 2-3 hours for normal maintenance. Then I would have to activate my car alarm just to find my car afterwards, glove compartment looked ransacked, very low tire pressure. But this time...I was greeted by Kyle June, Service Manager. He was professional and courteous, took excellent care of me and my vehicle, and told me where it was parked when I was ready to leave. My wait time was much shorter, as well. Kyle is a treasure, and you should do whatever is necessary to keep him there. Thanks, Kyle! Great experience this time. I ENJOYED WORKING WITH SALESMAN JUSTIN AND THE INTERNET SALES MANAGER JK. MY EXPERIENCE FROM THE FIRST POINT OF CONTACTED WITH JK RIGHT DOWN TO SIGNING THE DEAL WITH JIMMY WAS AWESOME. JUSTIN IS A GREAT SALESMAN HE EFFECTIVELY LISTENED TO MY NEEDS AND WORKED VERY HARD TO GET ME A REALLY GREAT DEAL AND HIS PRODUCT KNOWLEDGE WAS SPOT ON. I CANT THANK THE TEAM AT THOMASVILLE TOYOTA ENOUGH AND WILL BE BACK TO BUY MY DAUGHTERS FIRST VEHICLE.